​Computers are a tool used to support learning and to heighten instruction. Computer networks allow people to interact with computers within the school and with other computers around the world. With the popularity of the Internet growing each day, it is imperative that parents, staff, and students understand that an Acceptable Use Policy is necessary to ensure that our computers and the network be used in a responsible, ethical, and legal manner. Failure to adhere to the acceptable use policy will result in the user’s access being revoked by the local school administrator. Parents and users (including staff and students) should understand that steps are taken to mitigate the connection to or the downloading of offensive material. However, due to the dynamic nature of the Internet, there is no fail-safe way to insure that students or staff are completely isolated from controversial, offensive or questionable content. Every school year, as part of the welcome back packet provided by your child(ren)'s school, parents and students are required to sign and submit an internet access and use policy. A signed form must be received before a student will be given access to the internet and various devices such as iPads and Chromebooks. To download a copy of the parent consent form, see the link below. 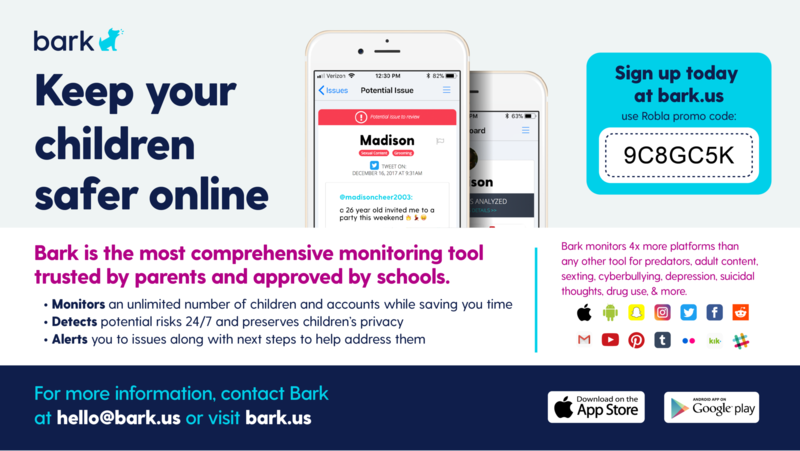 For more information about Bark, or to sign up for the parent version, please visit Bark.us. The Robla School District Technology Department works tirelessly to protect the overall network infrastructure and to limit the harmful content available to students. For more information about CIPA Compliance, please check out the Children's Internet Protection Act (CIPA). The Robla School District utilizes Google for Education to manage and support Chrome and Chromebook devices used through the district by students and staff. As part of using Google for Education, the district is required to inform all parents of the information that is shared between Google and the district and how privacy is handled. To review the privacy policies for Education, please click the link belows.